Among what seems like a million Games Workshop licensed games, Fatshark's Vermintide series is an obvious standout. See our GOTY hub for the rest of the awards and personal picks. Tom: There is some seriously excellent hitting in this game. When you whack a rat in the head with a hammer it blows up and the poor creature stumbles around a bit before falling over dead. Top hitting. Vermintide 2 is also a great example of how sequels can realise the intentions of the original game. With a fan base and more resources, Fatshark added a more engaging loot system, new environments and loads more enemies to clonk with hammers. 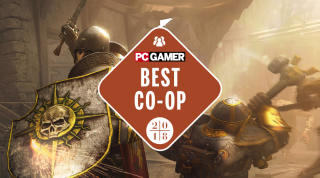 I’ve always thought that more games should copy Left 4 Dead, but Vermintide carves out its own niche with a strong melee focus and a surprisingly good realisation of the old world of Warhammer. I love it for that, but even if you’re not a fan, anyone can enjoy mashing up hordes with some mates. Samuel: I found Vermintide 2 too hard at launch, and I still don't quite get the loot system, but it's a much better version of what the first game was going for. Like Tom says, the combat is such an improvement over the original, to the point where I switched characters just so I had the opportunity to batter things more frequently. The environments are lovely, too—with the first game I felt like I was wandering around the same village or cave over and over again. Here I feel like I get a grander look at the Warhammer fantasy universe. Wes: I had fun with the first Vermintide, but it didn't have quite the variety to keep me coming back. Vermintide 2 does not have that problem. Sometimes I'm chopping giant rat men in half, and sometimes I'm decapitating raving Chaos lunatics. That's all the variety I need! But really, there's way more variety than that. Vermintide 2's best addition by far is its leveling system with subclasses for each character. I mainly played as grumbly dwarf Bardin Goreksson, and early in the game (especially before some balance changes made everything mercifully easier) I was all about tankiness, walking around with an axe and a shield that could soak up the damage and send a dozen enemies flying backwards with a nice shield bash. At level 7 I unlocked the ironbreaker class and naturally gravitated to that, since it made me even tougher and gave me a taunt skill, which made my tanky, defensive play more useful for the team. By the time I hit level 12 and unlocked the Slayer class, I was ready for a change. And playing Bardin as a Slayer is about as dramatic a change as you can get. He strips off his armor and goes full crazy dwarf, with a rad leap attack that sends him into a fast-swinging frenzy. He's all offense. Talent trees also give you a few skills to choose from all the way up to level 25, which is a satisfying progression arc for playing many hours of Vermintide 2, and also lets you further tailor each subclass to how you want to play. Vermintide 2 manages to be the rare game you can go into just to mindlessly smack around some bad guys with great melee combat, or get really into how you build your character and fit in with a highly functional team. That's a great co-op game. Phil: It's been said already, but damn, Vermintide 2 is some good hitting. I exclusively play Kerillian, meaning the majority of my time each mission is spent manically clicking the mouse, watching her spinning daggers slice through an actual horde of rats. There's a weighty presence for your foes that makes slicing, dicing and bludgeoning them feel incredibly satisfying. It might offer some of the most enjoyable melee combat in PC gaming. That it's also a great way to spend time with friends just makes it all the better. See Steven's original review here.